Discover sandy beaches, the Atlantic Ocean & all that Virginia Beach has to offer at the convenient & comfortable Holiday Inn SunSpree Resort Virginia Beach. Located directly on the Virginia Beach Oceanfront at the relaxing north end of the boardwalk, this is the perfect spot for your affordable fun-filled family vacation Bike rentals available or leave your car here & take the trolley down the oceanfront without the hassle of trying to park. Featuring 3 pools including Lazy River with rock formations & waterfalls, or our outdoor pool plaza with Coconuts, our poolside bar. Fun awaits the kids at KidSpree, our seasonal children&regs activity center. The perfect choice for everyone with its convenient location & amenities. We are just a short drive to Oceanbreeze Fun Park, Busch Gardens, Fort Story, Marine Corps Base Camp Pendleton, Oceana Naval Base & Old Dominion University. Enjoy onsite dining at Beach Scenes, which is open year-round for breakfast. For fine dining, Isle of Capri, our Italian restaurant is located on the 6th floor of the hotel, featuring a panoramic view of the Atlantic Ocean. 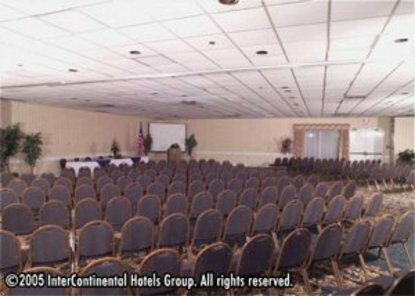 Offering over 9,000 square feet of meeting space, our professional & courteous staff is ready to help plan your meeting, Whether you&regre coming to Virginia Beach for business or just for fun, your room at the Holiday Inn SunSpree is your personal retreat. This hotel is committed to providing accessible facilities under the American Disabilities Act. If your accessibility needs are not met, please contact the Hotel Manager on Duty. Should you require additional information regarding accessible facilities for guests with disabilities, please call 1-800-Holiday (U.S. and Canada) or contact the hotel directly. For the hearing impaired, TDD service is available at 1-800-238-5544 within the U.S. and Canada.